The update patch on Oct. 22nd, 2018 has been finished at 5:55 PM (KST). We will have update patch on Oct. 22nd, 2018 4 PM (KST). Please check update details below. - Tutorial Skip Function adds. - Replay icon adds on battle result screen. - Unit stuck motion changes. - Scenario 5-3’s difficulty degrades. - Mail AD and Mission AD reward upgrades to 400 Gold from 300 Gold. - Guild name issue in battle field fixes. - Guild chat message limit changes to 40 letters. - Battle Score points rule changes. ㄴ Matching range extends to stabilize matching in high tier. 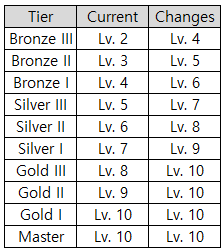 - Unit research limit changes. You may not able to play Triple Hearts during the patch. To prevent unrecognized issue, please log out before the patch start.